East Rutherford, N.J. - The Central Connecticut State University football team was picked as the Northeast Conference’s preseason favorite at the league’s Social Media Day at MetLife Stadium, it was announced on Tuesday. The defending NEC champion, the Blue Devils also had seven players named to the Preseason All-Northeast Conference Team. Central’s offense, which is slated to return eight starters, had four players named to the Preseason All-NEC Team. Leading the returnees is senior quarterback Jacob Dolegala. A three-year starter, Dolegala became the program’s all-time leading passer last season. In 33 career games, he has thrown for 5,908 yards and 32 touchdowns. He was also named the league’s Offensive Player of the Week on Nov. 13 after figuring in all four touchdowns of CCSU’s win at Duquesne to clinch the league title. Junior J’Von Brown and sophomore Connor Mignone, a pair of Blue Devils who helped anchor the offensive line last season, were also named to the preseason team. Mignone collected a slew of honors as a rookie, including NEC Offensive Rookie of the Year and Phil Steele Freshman All-American. He and Brown cleared the way for a ground attack that averaged nearly 185 yards per game and had the program’s first 1,000-yard rusher since 2014. They were also part of an offensive line that tied for ninth nationally, having allowed just nine sacks in 11 regular season games. 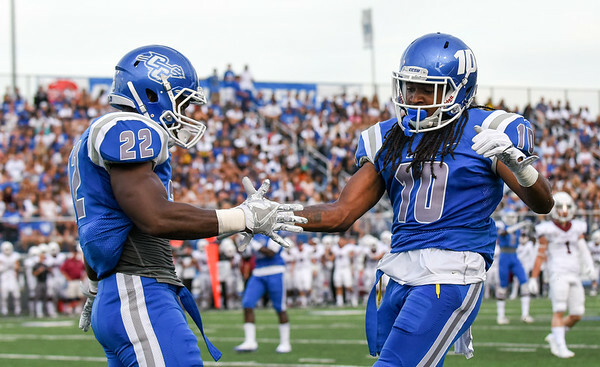 Junior Arthur Gilmore rounded out CCSU’s preseason offensive selections. He returns at tight end after earning All-NEC First Team honors last season. He played in all 12 games last year and had nine catches for 136 yards. Senior defensive lineman Chris Tinkham, senior linebacker Kenneth Keen and junior defensive back Tajik Bagley represented the CCSU defense on the NEC Preseason Team. Tinkham, an All-NEC Second Team pick in 2017, had 40 tackles last season, including three in the FCS playoff game. He finished with 5.5 tackles for a loss and 3.5 sacks. Keen ranked second on the team in tackles with 85 on the season, including 9.5 for a loss and three pass break-ups. Keen was also an All-NEC Second Team pick last year. Bagley led the league with 16 pass breakups to go with 42 tackles and a pair of interceptions. As a kick returner, he averaged 25.2 yards and was named the league’s Special Teams Player of the Week on Sept. 11 after returning the opening kickoff 95 yards for a score against Fordham. CCSU opens the 2018 season at Ball State on Thursday, Aug. 30. The Blue Devils will hold their home opener at Arute Field the following week against Lincoln (PA) on Friday, Sept. 7, at 6 p.m. The Blue Devils collected five first-place votes from the league’s coaches in balloting for the preseason favorite. Duquesne was second, followed by Bryant, with each collecting a single first-place vote. CCSU closes out the regular-season at home against the Dukes on Nov. 17. Posted in New Britain Herald, CCSU on Tuesday, 24 July 2018 20:56. Updated: Tuesday, 24 July 2018 20:59.